Su created Singing Our Socks Off to enable people to sing regularly and improve their voices. After running the group for a number of years she realised the effect the groups were having on social, health and well being of her members and how much benefit they were gaining as a result of attending. This prompted Su to turn SOSO into a community interest company which would allow members to be more involved and utilise the financial and business opportunities available to a CIC. For the past few years Su has been on a journey of learning all she can both about the voice, and leading singing groups. She is a member of the British Voice Association, Sound Sense, More Music and Sing Up and The Natural Voice Practitioner network. 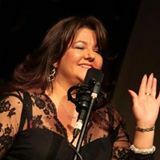 Su has attended many personal business development courses and well regarded industry recognised vocal tuition courses. Including Dane Chalfin 21st Century singer and Helen Rowson Estille voice. As a result she has gained valuable experience in using the most up to date voice techniques recognised by experienced vocal coaches, speech pathologists and speech and language therapists. Breathe Easy charity, (Part of the heart and lung foundation). Her work with SoSo and as a coach and singer have been featured on BBC’S last choir standing, North West tonight, Local papers such as Echo, Crosby Herald, Southport Visitor and national Magazines Prima and Take break. Su Is also a regular panel member on BBC Radio Merseyside’s Late night live with Linda McDermott. Each Monday Su meets with Linda and other panel members to discuss weekly topics, general chat, fun and laughter. Most of all is her passion is to help everyone, whatever their ability, to find their voice enjoy singing regularly and learn how to express themselves in all walks of life with a confident voice.